Beta-carotenes are naturally occurring chemicals that are responsible for the reddish-yellow color in various plants. As a natural color, beta-carotenes are adopted as food colorants in various food processing industries such as beverages, confectionaries, packed foods, and others. Beta-carotenes are sourced from plants, animals, and microbial sources in great quantities, in order to cater to the demand for coloring agents in various end-use industries. Beta-carotenes are rich in antioxidant nutrients, which has created a huge demand in pharmaceuticals and dietary supplements in recent years. Since beta-carotenes are a naturally occurring retinol, they are converted into vitamin A during the digestion process. This further creates the growing demand for beta-carotenes in functional foods and feed processing as a binding ingredient. Due to the presence of high concentration of antioxidants and vitamin A, beta-carotenes also find application in natural and synthetic cosmetics. Due to augmenting applications and rising demand, the beta-carotene market is anticipated to proliferate in terms of value and volume during the forecast period. The increasing use of beta-carotene in developing natural colors for various food and beverages has fuelled its popularity among consumers in recent years. Along with food and beverages, beta-carotenes are gaining huge traction in dietary supplements, as consumers are showing more interest towards natural and supplements that are rich in vitamins and minerals. Due to the growing demand for organic and natural cosmetics among consumers, manufacturers and product developers started using beta-carotene as a key ingredient in several cosmetics and personal care products. However, natural beta-carotenes have recently been introduced in organic cosmetics. Due to this, it is expected that, there will be launches of new products with natural ingredients, such as beta-carotene, which is anticipated to drive the growth of the global beta-carotene market during the forecast period. In Europe, beta-carotene is the most preferred colorant used in food processing industries. Beta-carotenes are widely used in food processing industries as a source of natural color, which provides varied versions of red, yellow, and orange. Due to the emerging demand for natural ingredients and additives, food processing industries have adopted beta-carotenes as a standard coloring agent in various products such as confectionaries, dressings, and other foodstuffs. Thus, the growing consumer awareness regarding the health benefits of natural color sources such as beta-carotenes in recent years is one of the major driving factors of the global beta-carotene market. The increasing prevalence of vitamin A deficiencies and related diseases in developing economies such as India, Bangladesh, Pakistan, and other South Asian countries has resulted in various public health concerns. As a precursor of vitamin A, beta-carotene is often utilized as a vital fortification ingredient in functional foods such as processed grains, fruit extracts, purees, and others, in order to fight vitamin A deficiencies (VADs). The increasing consumption of beta-carotene as a functional ingredient is anticipated to drive the beta-carotene market in terms of value and volume. As an organic compound, beta-carotene has greater application in drug development and carrier medicine processing. In addition, beta-carotenes are rich in antioxidant nutrients that treat oxidative stress and improve cognitive functions, which has created a huge demand for beta-carotenes among drug developers and pharmaceutical manufacturers for developing cognitive medicines, over the past decade. Thus, the pharmaceutical consumption of beta-carotene is one of the strong drivers that is fuelling the growth of the global beta-carotene market. Owing to their antioxidant properties, beta-carotenes are known to reduce the risk of diabetes. There have been studies associated with the dietary intake of beta-carotenes and the risk of type-2 diabetes. One such study has revealed that, those who follow a diet comprising beta-carotenes and alpha-carotenes present reduced risks of type-2 diabetes among generally healthy men and women. Cancer has created a significant social as well as economic health burden – around 8.8 million deaths across the world in 2015, and US$ 87.8 billion expenditure in 2014 for the direct medical cost of cancer treatment in the United States. The World Health Organization estimates that around 253 million people are living with vision disabilities, among which, 36 million are blind, and 217 million people suffer from moderate to severe vision impairment due to vitamin deficiencies. Beta-carotenes have been studied for their anti-carcinogenic properties. The consumption of beta-carotene supplements and medicines formulated with beta-carotenes as a possible prevention of cancer (lung) has been studied extensively. The increasing utilization of beta-carotenes in preventing and curing chronic diseases is likely to escalate its demand in the near future. Bound to all the above driving factors, it is anticipated that the global beta-carotene market would proliferate in terms of volume and value during the forecast period. Beta-carotene is defined as the pigment that is responsible for red and yellow coloring in various plants and fruits. Beta-carotene belongs to a class of carotenoids that are rich in antioxidants, and help protect cells against oxidation damage. Beta-carotene is generally sourced from natural sources such as fruits, vegetables, algae and fungi, and synthetic sources. This pigment is further utilized as a coloring agent in food, feed, pharmaceutical, and cosmetic industries. As a rich source of vitamin A (retinol), beta-carotene is also used in dietary supplements and nutraceuticals. Due to augmenting applications and rising demand, the beta-carotene market is anticipated to proliferate in terms of value and volume during the forecast period. 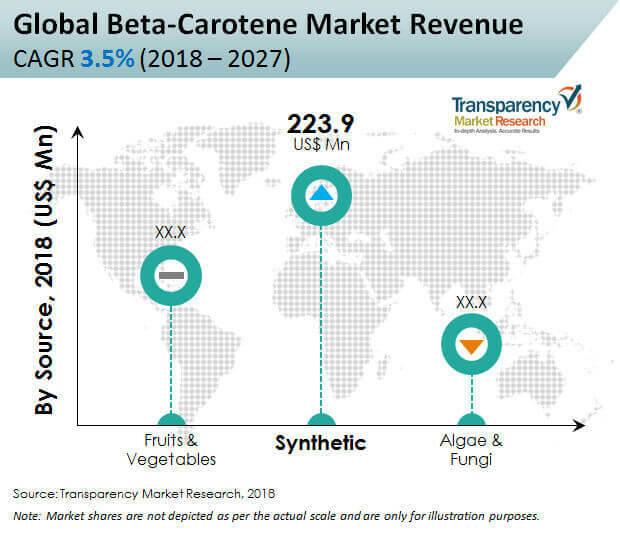 The proposed market report of Transparency Market Research on the global beta-carotene market evaluates opportunities in the current scenario, and provides latest updates and detailed insights corresponding to different segments involved in the global beta-carotene market during the forecast period 2019-2027. The beta-carotene market report further indicates the estimated data for 2019, and forecast data up to 2027 in terms of value (US$ Mn) and volume (MT). In terms of value, the beta-carotene market is anticipated to increase at a CAGR of 3.5% during the forecast period. The present study exhibits the market dynamics and trends of the beta-carotene market in regions such as North America, Europe, Latin America, Asia Pacific, and the Middle East and Africa. The report includes the market growth drivers and challenges for the global beta-carotene market, and their impact on each region during the forecast period. The report also comprises the study of the drivers, restraints, threats, and opportunities for the beta-carotene market, to provide a substantial view. It also includes value chain analysis and opportunity analysis of the market. The report explores the global beta-carotene market for the period 2019-2027. The principal objective of the beta-carotene market report is to provide insights into the key developments in the market that are constantly supporting the transformation of global businesses that are associated with beta-carotene. It is very important to consider that, in an ever-wavering economy, we provide the estimated (Y-o-Y) year-on-year growth rate in addition to the Compound Annual Growth Rate (CAGR) for the overall forecast, to understand the better analysis and evaluation of the global beta-carotene market, and to discover justifiable opportunities. The unique key feature of this report is that the evaluation of the global beta-carotene market and its relative revenue forecast is carried out in terms of absolute dollar opportunity. This is usually not considered while forecasting overall market value. Absolute dollar opportunity analysis is very crucial in evaluating the intensity of opportunity that a provider can observe to execute, as well as to contrast the potential resources from a sales perspective in the global beta-carotene market. The beta-carotene market report starts with an elaborate executive summary, the market definition of various segmentations that are included, and their respective shares in the beta-carotene market. The report also provides insights regarding the major macroeconomic factors that have a significant effect on the growth of the beta-carotene market. The market report further emphasizes the various dynamic factors that influence the beta-carotene market, which include the drivers, restraints, opportunities, and trends in the global beta-carotene market. The report further underlines the study of the present issues with industrial processing, and opportunities for the beta-carotene market. It also includes a value chain analysis that provides a comprehensive view of the overall profitability from the raw material supplier to the final end user in the beta-carotene market. In order to give users a clear view of the global beta-carotene market, we have exhibited a competitive analysis of key market participants and their strategic developments. The competitive dashboard presents a detailed comparison of the global manufacturers of beta-carotene on vital parameters such as product portfolio, total revenue, key developments, and key strategies. The study presents the beta-carotene market attractiveness analysis by source, end use, and region. To analyze the overall market size of beta-carotene, the report considers various preliminary aspects based on secondary research. Furthermore, it highlights quantitative estimation such as market share by source, end use, and region, and other qualitative data from primary respondents, which have been integrated to arrive at unambiguous and accurate market estimations. The forecast presented in the beta-carotene market report arrives at the total revenue being generated, and the expected revenue contribution in the future by the global beta-carotene market. Detailed profiles of various companies that manufacture beta-carotene are included in the report to evaluate their developmental strategies, product offerings, and recent developments, as they have a significant role in the beta-carotene market. Important market players covered in the beta-carotene market report are BASF SE., Koninklijke DSM N.V., Chr. Hansen A/S DDW The Colour House Corporation, Vidya Herbs Pvt Ltd., Allied Biotech Corporation, Novus International, Nutralliance is US, Vinayak Ingredients India Pvt Ltd., NOW Health Group, Inc., BioExtract, Carotech Berhad, Döhler GmbH, FMC Corporation, Archer Daniels Midland Company, ColorMaker, Inc., Penta Manufacturing Company, Food Colour Innovation S.L., Kingherbs Limited., TCI Chemicals (India) Pvt. Ltd., and others.